If American Eagle buys Abercrombie, it’s probably time to sell both stocks. Shares of American Eagle Outfitters (NYSE:AEO) recently tumbled on reports that the apparel retailer was considering a bid for its rival Abercrombie & Fitch (NYSE:ANF). The idea isn't surprising, since both retailers have struggled with the rise of fast fashion competitors like H&M, fickle consumer tastes, declining mall traffic, and a shift toward e-commerce channels. But judging by the market's reaction, American Eagle Outfitters investors seem to hate that idea. Let's take a closer look at the reasons American Eagle might be considering buying out Abercrombie, and why it could be a terrible idea. If American Eagle buys Abercrombie, the two companies could merge their production facilities, eliminate redundancies, and cut costs -- which could boost operating margins. After clearing the initial acquisition costs, the merger could bolster American Eagle's free cash flow and give it more room to raise its dividend or repurchase shares. Buying Abercrombie might help American Eagle fix its weakness in men's apparel. Comparable store sales at AE's men's apparel fell 7% during its fourth quarter due to weak sales of tops. AEO Global Brand President Chad Kessler addressed that softness by stating that the company would do more research and trend analysis in men's apparel, and recently hired a new men's GMM to lead a turnaround effort. Adding Abercrombie & Fitch and Hollister to its portfolio could give American Eagle's men's business a shot in the arm to complement the popularity of its namesake denim products and Aerie's lingerie and activewear with female shoppers. American Eagle could also integrate Abercrombie and Hollister with menswear label Todd Snyder and its collegiate apparel brand Tailgate, which AE acquired in late 2015. Those ideas sound interesting, but most of them quickly fall apart with a few simple comparisons. First, there's a huge difference between American Eagle and Abercrombie's growth figures -- American Eagle's total comps rose 3% in fiscal 2016, but Abercrombie's fell 5%. AE's namesake brand posted 1% comps growth, while its smaller Aerie brand posted 23% growth. However, Abercrombie's namesake brand reported a 11% comps decline last year, while Hollister's comps stayed flat. It's hard to see how American Eagle would benefit by absorbing Abercrombie's significantly weaker brands. 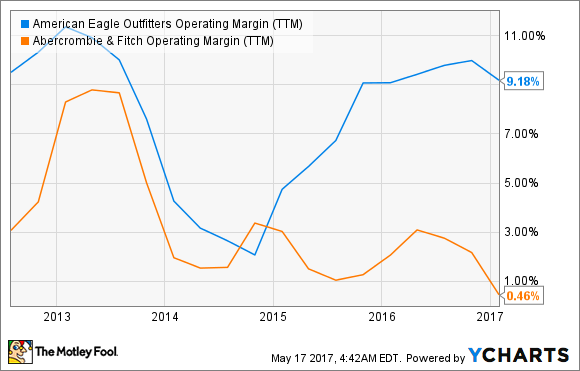 American Eagle also has much higher operating margins than Abercrombie & Fitch, as seen in the following chart. Therefore, merging with Abercrombie would more likely reduce American Eagle's operating margins instead of generating significant cost-cutting synergies. Abercrombie & Fitch currently has an enterprise value of just over $700 million, but it's also shouldering $263 million in debt. This means that with an acquisition premium factored in, it will cost American Eagle at least $1 billion to buy Abercrombie. American Eagle finished 2016 with just $379 million in cash and equivalents, with a trailing 12-month free cash flow of $203 million -- so it would either need to take on more debt or use stock to seal the deal. Neither decision makes sense when the company still hasn't fully expanded its Aerie and Tailgate brands. Piper Jaffray's recent "Taking Stock with Teens" report reveals that teen shoppers heavily favor athleisure apparel , which are better served by Aerie and Tailgate than Abercrombie's brands. American Eagle also lacks the bad karma which Abercrombie accumulated with former CEO Mike Jeffries' infamous comments about Abercrombie being an "exclusionary" brand for "cool kids". Lastly, many brick-and-mortar retailers are reducing their store counts while investing more heavily in e-commerce initiatives to find the "right" number of stores which can post sustainable comps growth. Adding Abercrombie's 898 stores to American Eagle's current store count of 1,226 stores seems like a running leap in the opposite direction. I've stayed invested in American Eagle Outfitters because I thought it was well run, undervalued, and paid a solid dividend. But if American Eagle really decides to buy Abercrombie, I'll likely sell the stock for the aforementioned reasons. Recent reports indicate that American Eagle isn't Abercrombie's only potential suitor -- Express (NYSE:EXPR) has also expressed interest. I personally hope that cooler heads prevail at American Eagle and let Express have this one, since a desperate bid for Abercrombie could send this well-run apparel retailer off a cliff.